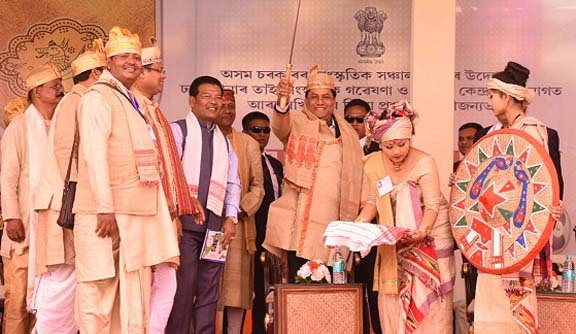 In a bid to preserve the rich legacy of 42 Ahom kings and cherish their contributions in building the edifice of greater Assamese society, the Assam government would set up a memorial park in the State. Assam Chief Minister Sarbananda Sonowal announced this while taking part at the central Me-Dam-Me-Phi celebration in Dhakuakhana of Lakhimpur district on Thursday. The celebration was organised by the Cultural Affairs department of the Assam government in association with the Dhakuakhana Tai Cultural Research and Development Centre and Lakhimpur district administration. Speaking on the occasion, Chief Minister Sonowal underlined the contributions of the Ahom kings for giving a distinct identity to the Assamese community in the world and asserted the State government’s commitment to follow their ideals in building a robust and resurgent Assam. “The Ahom kings gave a strong foundation to the Assamese community following the ideals of harmony, co-existence and mental sturdiness. Their principles of governance remain the fountainhead of inspiration for the Assamese community to march ahead in the days to come,” said Sonowal. Stating that first Ahom King Swargodeo Chaulung Siu-Ka-Pha set the foundations of a united Assam through assimilation of various communities, Sonowal termed the 600 years of Ahom rule as golden period in world history, which continues to awestruck the intelligentsia world over. Moreover, stating that Chaolung Siu-Ka-Pha enriched the social, cultural and spiritual life of the State through his visionary leadership, the Assam CM also spoke about the importance the great Ahom ruler attached to work culture and ensuring a dignified life for the people. Assam CM Sonowal also stressed on the need for abjuring violence and adopting peaceful co-existence as the strongest tool to take the state forward. The CM reasserting the state government’s commitment to safeguard the interest of the indigenous people of the state said the government is not against any democratic and non-violent dissent. However, if somebody takes law into his hand, the government would be left with no option but to take appropriate action against such person, the CM said. He also said there has been a misinformation campaign being spread by certain vested interest groups regarding the Citizenship (Amendment) Bill and said the state government is working with commitment for preserving the identity, culture, heritage and rights of the indigenous people over their land. Sonowal also announced that the state government would extend financial assistance for construction of a permanent auditorium of the Tai Cultural Research and Development Centre at Dhakuakhana. Sonowal on the occasion also felicitated 14 local eminent personalities for their contribution towards the society. Minister of State (i/c) Cultural Affairs, Naba Kumar Doley, Minister of State (i/c) Power Topon Kumar Gogoi, MP Pradan Baruah and president of Purbanchal Tai Sahitya Sabha Dr. Dayananda Borgohain also delivered speech on the occasion. While former president of Purbanchal Tai Sahitya Sabha Manoranjan Phukan inaugurated the celebration, secretary of Cultural Affairs department Madhurima Baruah offered the vote of thanks.